A 14-pound, 1.8 ounce Atlantic spadefish caught by Stacey Nickleson, 19, of North Augusta, South Carolina is the new state record. Nickleson caught the record fish on July 2 while bottom fishing with a jelly ball strip out of Station Creek, Beaufort on the Betsy Ross Reef with a 14-pound test line. She fought the fish for 30 minutes aboard the boat "Marked Man," captained by Monty Bates of Aiken. 2003, was 12 pounds, 15 ounces. It was also caught out of Station Creek and at the Betsy Ross Reef. 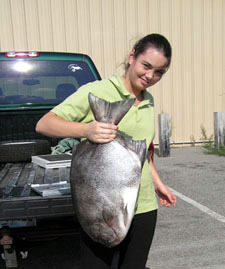 According to Tom Dupre', who administers the marine game fish state records program for S.C Department of Natural Resources, anyone catching a potential state record must have it weighed on certified scales with two witnesses and should immediately contact the DNR Marine Resources Division at (843)-953-9365 in Charleston.